Now this session was really cool fun – and I mean literally! Mum, Dad and two energetic brothers braved a very cool -5 degrees to come and have some fun in the freshly fallen snow of the Uppsala castle and grounds. It may have been cold but we were blessed with the most brilliant golden sunshine, shining it rays through a beautiful old tree on the castle grounds, creating one of the most stunning scenes I have ever witnessed and the most perfect background for the first part of our photo session. With snowball fights, running around in the fluffy snow, hiding behind one gigantic tree and riding the cannons this was one creative and energetic photo session! Just as well – otherwise we all may have frozen! There was a chance for mum and dad to have a few intimate moments together whilst the boys giggled and messed around in the background! 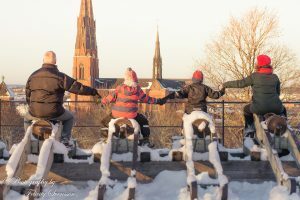 The session was really enjoyed by us all and was a wonderful way to make a memory of this families first visit to a beautiful part of Uppsala.